Havaianas have been spreading the love, joy and sun of Brazil since 1962. Their first flip flops inspired by the traditional Japanese, Zori sandal that had a sole made from rice grains, spurned the collection of laidback, free spirited rubber soled flip flops that are just as well loved today. 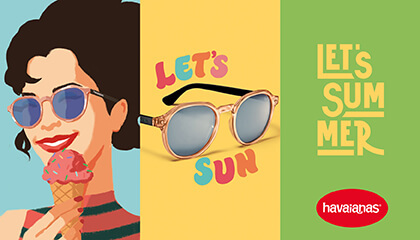 And now introducing their new line of sunglasses made rubber and available in bright colours, Havaianas are recreating the same laidback and free spirited feeling, in the form of trendy shapes that will add a touch of fun to your day.